This is a NEW Merit Badge. The following abbreviated list represents the RSTC “Minimum Course Content for Open Water Diver Certification.” It is not intended as a complete outline of learning objectives for an Open Water Diver course. Development of learning objectives is left to the respective training agencies. During the Open Water Diver course you can look forward to learning basic scuba theory and developing entry-level scuba skills required for certification. All scuba instruction must meet the minimum training standards for Entry-Level Scuba Certification set by the Recreational Scuba Training Council (RSTC). Your course will consist of the topics and scuba skills required by the training organization and as outlined in this section. At a minimum, the following will be covered. Equipment. Learn the physical description, operating principles, maintenance, and use of the following equipment items—face mask, fins, snorkel, BCD, exposure suit, weights and weight system, float and flag, cylinders, valves, regulators/air-delivery system, submersible pressure gauge, alternate air source, timing device, compass, depth gauge, dive table or dive computers, knife. Physics of Diving. Learn the physical principles of matter and their application to diving activities and hazards. Medical Problems Related to Diving. Learn the causes, symptoms, prevention, and first-aid and treatment of diving medical problems. Decompression Theory and Use of Dive Tables and/or Dive Computers. Learn how to determine no-decompression limits for single and repetitive dives, plus how to use dive tables and/or dive computers to properly plan and execute a dive. Dive Environment. Learn information on the local and general conditions of the diving environment and their possible effects on the diver. General Topics. Learn information on dive planning, underwater and surface communications, diver assistance, recommended diving practices (including safety stops), procedures for diving from boats, proper use of personal diving logbook, and local dive regulations and protocols. Pool/Confined Water Scuba Skills. Learn and practice the following scuba skills in a pool or confined water. Open Water Scuba Skills. Perform the following scuba skills while diving in open water. SDI - Scuba Diving International. In addition to the agencies listed by name, any current member of the World Recreational Scuba Training Council (WRSTC) is also recognized. Scouts who have already earned an Open Water Diver Certification outside of a BSA activity from a scuba agency recognized by the Boy Scouts of America scuba policy may still earn the Scuba Diving merit badge by earning the Swimming merit badge and completing all other listed requirements. Scuba Diving. All phases of scuba instruction - classroom, pool, and open-water training—are limited to instructors trained and certified by one of the BSA's recognized scuba agencies as found in the Guide to Safe Scouting. Counselors for the Scuba Diving merit badge must be registered with the Boy Scouts of America and be approved by the district/ council advancement committee. Like other merit badges, the Scuba Diving merit badge has been developed to teach and train youth in a manner consistent with the overall goals and values of the Boy Scouts of America. The merit badge counselor should be fair and consistent when presenting and evaluating the knowledge and skills specified by the requirements. None of the requirements may be modified or omitted. All phases of scuba instruction—classroom, pool, and open water training—must comply with the minimum training standards for entry-level scuba certification adopted by the American National Standards Institute (ANSI) or the U.S. Recreational Scuba Training Council (RSTC). The RSTC is recognized as the ANSI Accredited Standards Developer for recreational diving instructional standards. The BSA acknowledges those standards by limiting scuba instruction only to instructors trained and sanctioned by recognized scuba agencies. Each approved instructor must follow the training protocols established by his or her authorizing agency, including limitations and special provisions based on medical conditions and age. For Scout divers under age 15, this will include restrictions for maximum depth, buddies, and supervision ratios. 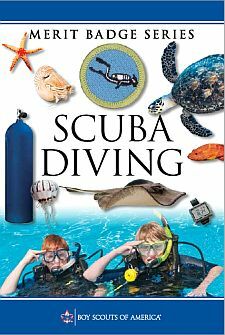 When scuba diving is taught in connection with any local council program, such as offering the Scuba Diving merit badge at summer camp, instructors should provide the training on a contract basis. Such instructors should have dive store or other commercial affiliation that provides liability coverage. Direct employment of scuba instructors is not recommended. Local council programs may not compress or sell air for scuba use, or sell, rent, or loan scuba equipment (scuba cylinders, regulators, gauges, dive computers, weights, BCDs). All air and scuba equipment for local council use must be obtained from professional sources (dive stores, resorts, dive boat, etc.) affiliated with a scuba agency recognized by the BSA.